TDV 2009, Stage1. Masters 3 plus+. A typically sunny Nelson day on the 35km Hope Circuit just out of Richmond. Its a 7km rectangular circuit among the vineyards with a tiny riser (KOM points) on the furthermost corner. The plan was to keep my nose clean and keep an eye on any breakaways. Brian Fowler wasnt there so that left Hawkes Bay's Kerry Harford as the obvious rider to watch. Having not done the TDV for quite a few years I didnt know a lot of the names, except for Brent Harris who had won the tour on a previous year on the Takaka Hill stage. Brent was one of the Warmup team that seemed to be everywhere all the time. Sprint points, KOM points, stage wins, they were going for everything. I had all my eggs in the Takaka Hill basket so was going to keep my powder dry until then. History shows that the final General classification pretty much echoes the finishing order up the Takaka Hill stage. 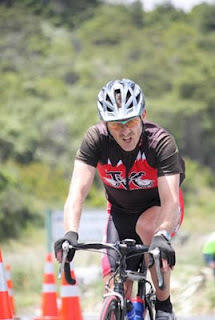 I was well short on racing but had hoped that I'd done enough hard yards in the hills. After a largely uneventual race, the bunch thinned in the dying moments of the sprint for the finish line, and a gap opened up on the inside. Wahoo! I was through and crossed the line in 3rd place with a good gap to the bunch. Its a pretty rare occurance that I would feature in a sprint, but I guess that shows what you can do when youv'e been hiding in the bunch the whole time. Kerry Harford seemed to have employed his usual tactic of riding off the front so hard that no-one could come around him and effectively leading himself out for the sprint! It was close though as he barely pipped Greg Atkins. 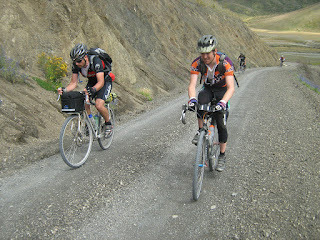 Day 2 was the 90km St Arnaud stage which took in the Spooners range. A few of the non-climbers were worried about it, but once again history shows that the bunch usually regroups on the other side of the hill. I positioned myself in the front couple of riders and was pleased to see a few of them gasping as we got to the brow of the hill which had some KOM (king of the mountains points). I was feeling pretty damn good so thought I might have a crack at them just for a laugh. No sooner had I launched a bit of an attack and who should leap out of the bunch in exactly the right gear but Greg Atkins! I got 2nd in the KOM sprint and we kept our heads down to see who we could drop down the other side. I think about 8 of us got away, and we started to really hammer downhill and onto the flat at over 50kmh. Kerry Harford was driving it hard and I have to say I was hoping the chasing bunch would catch us in a hurry, as I didnt have enough racing in my legs to be able to ride at that speed for the next 70 odd kms! Luckily the bunch, hauled along mostly by my buddy Paul Lewin and at least 1 other guy managed to catch us. God knows how, but I was happy when we stopped trying to gap them. The pace settled down after that and it was only really the odd rolling hill that was there to test us. Unfortunately the next feedzone coincided with the next KOM points, so if youv'e seen the opening few minutes of the movie "Saving Private Ryan" it was a bit like that. People sprinting.... spouses thrusting their water-bottled fulled hands in front of your face, trying to reach a husband foolishly stuck in the middle of the bunch... What a mess. It was also the point where I noticed my legs were AWOL! Aaagh... 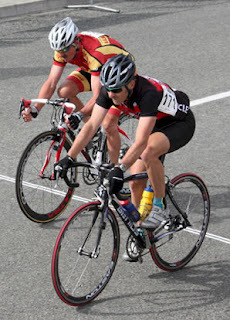 I mangaged to get entrenched back into the bunch and started to worry about where my legs had gone... I dont think we had even been riding for 2 hours. At some point on the outskirts of St Arnaud on a slight roller someone threw in a small attack. I felt the lights go out compeltely in my legs like someone had pulled a fuse, and I started to panic. I chopped down a couple of cogs and managed to hang in by the skin of my teeth. Before long we were approaching the township of St Arnaud and I would guess half of us had no idea where the finish was. A sign with 'Sprint 1km" appeared on the side of the road and people started to wind up. Way to early. It was downhill and around a corner and there were people all over the road. Scary as. Once again Kerry Harford took out the sprint from local rider Richie Howes and Warmup's Brent Harris who always seemed to be up the front. I was pretty disappointed. My legs were completely blown. What chance did I have for the 130km stage the next day that was to finish with the infamous 50 minute Takaka hill climb? An estimated 4 hours, and my legs had crapped out at 2 hours today. The answer came to me while at a friends BBQ that night. Gazza had one of those foam massage rolls. By using it I found that my quads were fully cooked, but my glutes were fresh as..... Why was it that I could ride for 4 hours on the gnarliest hills in Wellington and have no problems, but as soon as I did a race, my legs were cooked at 2 hours? As a time triallist I have a tendency to creep forward on the bike seat... and I had already made some positional adjustments and moved my seat forward substantially earlier in the year. I think I had overdone this repositioning of my seat. My position was too forward and was overloading my quads. I needed to start using my glutes if I was going to get get through the next days stage. It was a big risk, but I whacked my seat back 2 cms and hit the sack, full of doubt for the next days 130km stage. Day 3. 130kms. The Takaka Hill day. The next day was like any other. The legs didnt seem to be particularly tired. I seemed to have more than my usual toilet breaks before the start but it was all to no avail. Sometime after the first sprint I had a real bad urge to take a leak. Bugger. Marco had been telling me about the new Steve Gurney book, and how he describes learning to relieve himself on the bike. I was getting desperate and it was playing on my mind. There was a hill coming up. If I stopped now I might not get back on the bunch? All of a sudden I saw a guy pull over for a comfort stop. I did the same! At least I'd have someone to work with to catch the bunch again. As I stopped I was comforted to see half the bunch pull over! Was it Takaka Hill nerves or what? Anyway. After a lengthy stop we took off again and regrouped. Not much happened after that. A gradual climb up the Rae Saddle and some gradual downhill with tailwind. People just seemed to be tootling along. There was the odd breakaway here and there that didn't amount to much. The feed station/KOM points at Stanley Brook was the usual chaos. It was a sad sight when the guys going for points expired halfway up the hill as the sign saying "KOM 100 meters" was a bit premature to say the least. I accidently rolled over Brent and Greg who were both after points. They were gasping. A small breakaway started over the top but was soon brought back to the following bunch. Some time later Brent Harris rode off the front as nobody was coming though to take a turn. No one was keen to chase either so I ended up chasing him down and of course dragging the whole bunch up to him. It was at about this point, over 2 and half hours into the race that Kerry Harford mentioned the 2 guys who were up the road and had 7 minutes on us! What? Apparently two guys from the Thule team in Christchurch had ridden off after the first sprint just out of town, and had 7 minutes on us! At least 2 minutes of that was our rather relaxed toilet break! This was a big news to me. The stage, and indeed the whole race was effectively over if we didn't bring them back. Nobody was interested. There is a big disparity in the level of training people do in Vets racing. There are guys who would be close to 20 hours a week training, and others lucky to be doing 8 hours. Most of us wouldn't be able to lap it out hard enough to pull back that deficit. We continued tootling, along saving ourselves for the Takaka Hill and at very best, 3rd place in the stage, and 3rd place overall on General Classification (unless the breakaway guys exploded spectacularly). The only good news was that my legs felt mint. I had been making a concious effort to sit back on the seat more to try to take the load off my quads. We got to the bottom of the Takaka hill at around 2 and 3/4 hours give or take. Kay and Iva had water bottles for us and we grabbed them and hit the gas. Bang. The bunch was dropped. Myself, Greg Atkin and local ex-pat englishman Rob Searle had made a break. We quickly put time on the rest and spun up the steepest part of the hill with relative ease. It became obvious to me pretty quickly that Rob knew this hill like the back of his hand, as he threw in little surges at certain locations. I was able to respond and catch on to each one, and then come through for a turn. Greg was taking turns too, but was letting me do the main bridging. I figured that maybe he was more tired than I was, or maybe he was just riding clever. Rob was definitely the strongest rider and he was setting the pace. I think we were still together with 5kms to go, but my memory is clouded. A friend had given me a gel to take so I thought I better take it before it was too late. I reached into my pocket and fumbled for it just in time for Rob to throw in another of his well timed surges. Stuff it. Greg could chase that one down. We were now dropped from Robs wheel. While you may not think there is much drafting while riding up a hill like Takaka, the truth is, the pychological draft is immense. You lock onto that rear wheel in front like a heat seeking missile. Greg and I were offically dropped. We had to share the load between two now, and I was starting to flag. Rob was just up the road, at times he seemed close, at others he seemed to be moving away. Some time later we hit the short downhill part of the hill but we couldnt catch Rob. Greg was now doing more than his fair share and I was just hanging on. Not long after that, the red and yellow apparition that was Brent Harris loomed up from behind in true "terminator" style. Standing up and swinging on the bars in a crazily tall gear, he was eating back into our lead. We were less than 2 kms from the top. Brent eventually accelerated past us and Greg managed to latch on. I didnt. I was fading fast. 1km to go and who should come up behind me but the other half of Brents Team, Mark Forsey and my buddy (and sworn enemy; ) Marco Renall. Marco and Mark sprinted for the line and beat me by 12 seconds. It was a bittersweet finish. We had let two guys steal the march on us without even knowing it. They hadnt featured in any other part of the race, but then again, thats probably a good strategy, the same one that Rob Searle used. They probably werent hill climbers so they took their chances on a crazy breakaway. It had been done before, and this time it paid off for them. I had attacked the hill hard at the bottom and backed myself but blown short of the summit. Marco had spanked me in the dying moments, but the good news was, my legs had lasted the distance (mostly). My seat stayed where it was. Stage 4. 35kms. The Hill St Circuit. Based in the small hills above Richmond this is a torturous little rectangular circuit bisected with a couple of grunty little climbs and a series of 90 degree corners. The last time I did this tour I actually snuck away un-noticed for the win on this stage. There was only one person here who was present last time (Kerry Harford) so I figured he would have forgotten and I might try it again? It wasnt to be. A very strong (for Nelson) southerly came up and any attempts at getting away would have been shut down immediately. So it was a bit of a procession. I had a stab at a couple of the sprints and think I got a 2nd and a 3rd in the last two. No major changes to GC. Kerry won all the sprints and the final dash across the line to wrap up the Sprint competition and win 3 of the four stages in the tour. Its not for nothing that he has been the National road champ in Masters 2 the last 2 years. The Thule guys (Barry Tinker and Richard Naylor) kept their 1st and 2nd postions overall and Rob Searle came 3rd. Like me, Rob had put his eggs in the Takaka Hill basket, but unlike me, he held it together to the top and would have easily had the fastest ascent. 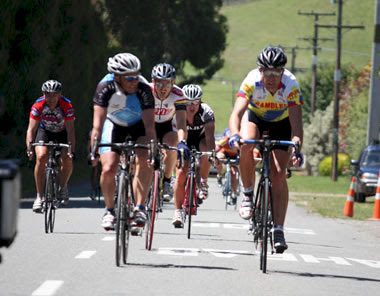 The Tour de Vineyards is a great tour to do, with a relaxed atmosphere and always good weather. Its especially good if you like hills, but even if you dont, the bunch usually regroups on the other side, so even the Clydesdales are there to have a crack at the sprints.